(From Pentax lens literature) The unique Pentax SMC P-FA 31mm f/1.8 AL Limited lens offers exceptionally high image and a wide-angle perspective. It incorporates a glass-molded aspherical lens element into its 9-element, 7-group optics, and offers sharp, crisp image reproduction, even at the maximum aperture of f/1.8. It features a beautiful aluminum body with metallic silver finish comes equipped with a flower-shaped lens hood. Also available in black. Very sharp quality lens, great look, and feel. Expensive is the only con for me. I'm not a professional photographer but my cousin works in the industry. We used the Pentax 31mm for some of the photos added to my moving company website, and it looks absolutely amazing. It's definitely a good quality and very elegant lens. The image is sharp. Hyperfocus and high-quality lens, best one I've used so far. The FA31 is an amazing lens, the sharpest I've come across, excellent for panormas, portraits, and landscapes. With its metal contruction, with a built-in lens-shade, and fairly substantial weight (almost a pound! ), it feels like a quality product through, and through. Sharp even fully open, with wonderful bokeh, ideal for those days with a clear sky, or in the studio. It doesn't like backlighting at all, so misty days are not ideal, nor sunsets, or street lights. The built-in hood isn't ideal, nor is the lens cap. It isn't easy to put on, and falls off occasionally, especially when the felt inside gets worn. Sharp warm images with high contrast and great bokeh. Color fringing, missing features like WR, quick-shift, and internal focusing. - The aluminum construction is high quality and has a great feel in the hands to it. I wish that more lenses were offered in aluminum like this. All I can say is find one to try and you will understand. - Sharp high contrast results with a warm feel to them. - Nice smooth background blur with the possibility of a 3D look. - Overall size of the lens fits well with current DSLRs (around the same size as an 18-55mm kit lens). It has enough room for your left hand to grip the lens while shooting. - The focus ring is easy to use in manual mode. - It’s a lens that should serve you for many many years, especially considering it is a full-frame capable lens. - The normal focal length on APS-C is pretty good and I probably use this lens more than any others that I own. - It’s expensive, especially considering on APS-C it has the properties of a “fast and cheap” 50mm lens. Just keep in mind 35mm lenses are usually more expensive, except for the DA 35mm f2.4 that was released this year. - My copy of the lens isn’t a stranger to purple/green fringing. - I don’t like how the front section of the lens connects to the back. It makes the lens seem lower quality than it is. Mine has a very slight wobble to it, but I think it’s within tolerances from what I’ve read online. This lens would be much more impressive if it had internal focus. - 9 aperture blades don’t seem like enough or the blades should be more rounded. My aperture blades don’t produce perfect circles unless the lens is close to maximum aperture. - Doesn’t have newer features like WR (Weather Resistance) and quick-shift that would improve usability of the lens. - The focus ring makes a geared sound when being rotated, which makes the lens sound a bit lesser than it could from a perceived quality standpoint. This is a quality lens overall, but I do see some room for improvement. Here is what I’d like to see in a revised 31mm Limited lens. - Change the designation to something like D-FA 31mm f1.8 Limited WR. - Make the lens completely internal-focus and give it quick-shift ability. - Add weather resistant sealing. - The optical design is already strong, but improve it if possible. The same goes for lens coatings. Make sure lenses of this caliber have a narrow sample variation. From other 31mm reviews I’ve seen, it looks like the purple fringing issue could be due to sample variation and not an issue of the older design. - Remove the built-in lens hood. - Keep the aperture ring. - Keep the all metal build quality. - Keep the screw driven auto-focus. Photos and more info on my blog. This is an amazing lens, at a premium price. 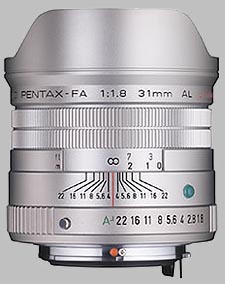 The 31mm can be used on a 35mm Pentax film camera or on a digital camera. On the K10D, with its cropped sensor, it becomes the equivalent of 47mm on a full frame camera. Used that way, as I do, it is essentially a fast "normal" lens. This is one of the sharpest lenses I have ever used (and I have used many Zeiss and Leitz primes as well as Canon L lenses). Even wide open, it renders impressive fine detail. Stopped down to middle apertures, it is razor sharp and contrasty from corner to corner. The difference in image quality compared to my 21mm, 40mm and 70mm Pentax Limited lenses is noticeable immediately in RAW files, before I do any sharpening. The detail rendered by the 31mm seems as if it has burned right through the camera's anti-aliasing filter. Grass, leaves, distant buildings--this lens makes the most of what the K10D sensor can handle. There is minimal barrel distortion and CA. Purple fringing is well controlled, although in some circumstances (wide apertures, very high contrast) it can be present. The lens renders out of focus areas smoothly. The 31mm is fast, with decent sized glass elements, and the build quality is top of the line. As a result, it has some heft, although it is not really large or heavy. It focusses quickly, probably because of its wide max aperture. The lens hood is permanently attached. If this focal length is what you need, and if you can afford it, this is the real deal--a high-performance, premium-built lens destined to be a classic. I have not used it on a full-format camera, but I imagine it would make a great wide-angle in that case. None, except the cost. You get what you pay for! I'm really impressed by the construction and quality of this lens. It is all metal construction, very solid, and is sharp and has an excellent "feel" to it. This serves as an excellent normal lens for the digital sensors. The multicoating is incredable. It was expensive, but I got my money's worth! !